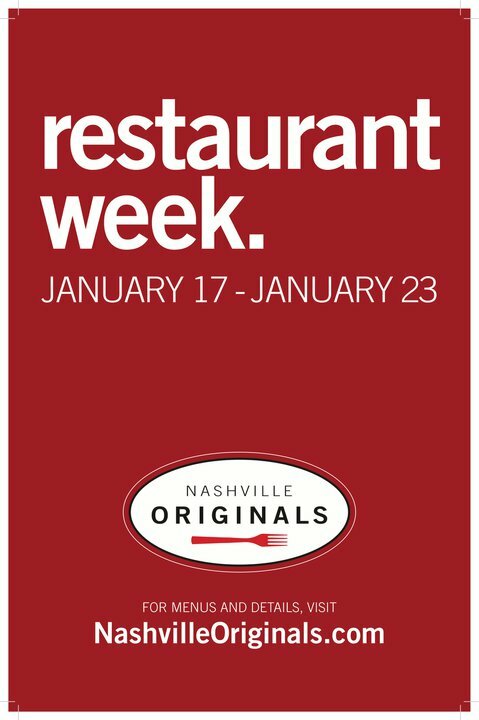 It's time again for Restaurant Week here in Nashville. Each participating restaurant has a special price and often a special menu for the occasion. 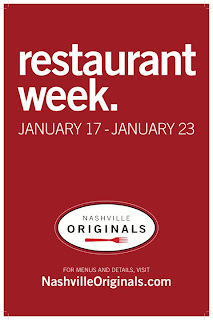 The Nashville Originals website has links to all the specials and menus available this week. It's a great way to get some affordable introductions to the city's best locally-owned restaurants. So far, I've made a reservation at Cha Chah with some friends and Mr. Eats and I may get out to Allium, Flyte, or Cafe Nonna later in the week (if reservations are still available!). Those are just a few of the restaurants that understand that vegetarians like good food, too. I just wish more restaurants were open Monday this week! Posted in News. Tags: Uncategorized on January 17, 2011 by Lesley. I'm busy perfecting a bread recipe/technique so in the meantime I'm happy to share that I've finally gotten the chance to get out to eat in the last month. 1. Macaroni and cheese--several kinds to choose from! 4. Brunch! (Wish I'd known this during the many times I've waited--and waited and waited--for a table down the street at Marche). Mad Donna's is kid-friendly downstairs and has a pretty cool space upstairs. Check their website for their awesome daily specials and events. If I lived in the neighborhood, I'd be a regular. I'd heard about Smiling Elephant for a while but I figured that it'd be just like all the other Thai restaurants in town. They're all good so what's the point in driving all the way over to 8th Avenue South? But one night, we had some time and we stopped in. Let me sum it up this way: Smiling Elephant will change your life. Wow, so good. And different! Not the standard pre-fried tofu splashed in some sauce (not that there's anything wrong with that). And not the standard dishes either. A smaller menu than some places but all dishes thoughtfully prepared. And fresh. I got the dinner "set" which included soup, entree and dessert (and a bonus ginger tea!). The soups are vegetarian and just about any entree can be made with tofu so you can imagine I was quite pleased. Mr. Eats actually ordered vegetarian food, too so that we could share! And everything was fantastic. Smiling Elephant is a small space. Even at 8pm on a Monday, it's busy so plan your first visit for an off time so you can really enjoy it. Tamarind tofu and ginger tofu--couldn't decide which I liked better! It's no secret to friends and family that I love New York style pizza. I like Neapolitan, too but I really love good NY style slice that you can fold and eat. House of Pizza in the Arcade and Joey's House of Pizza in Brentwood are my favorites locally but are nearly impossible for me to get to due to my West Nashville location. So I was pretty excited to see the sign for NY Pie go up over in Nashville West. Though I was a bit skeptical. I've had some pretty mediocre pizza in Nashville and Porta Via has been my go-to pizza since it opened. It's great, but it's Neapolitan. So on a chilly Tuesday night, my friend and I and Baby Eats stopped in around 6pm to try it out. First things first, the place is BUSY and small. They could easily fill up a space twice the size they have now. So when you want to try it, you may be best off getting takeout. Now the important part. The pizza is great! Very reminiscent of my favorite pizza, John's of Bleecker Street. The only thing they lack is RC on tap (no, really--RC on tap at John's--YUM!). There are a lot of specialty pizzas on the menu, but I got the basic cheese and really enjoyed it. My friend got the margarita and let me have a slice and it was good as well--a slightly sweeter and thicker tomato sauce to make it different from the standard slice (along with the chopped basil and fresh mozzarella). Speaking of slice, the menu indicates it's available by the slice, but I didn't see any pricing. I just got the 10 inch for $6.50 and though I shouldn't have, I ate the whole thing. The edge of the crust was a bit thicker and fluffier than a real NY slice, but it worked out well for me because I shared it with Baby Eats. Not all pizzas are like that--each pizza is hand-tossed (right in front of you!) and different from the last, so some pizzas may have a thicker edge. Small price to pay for a great hand-made pizza. NY Pie is locally owned and operated and really care about the pizza they're making (asking each customer what they thought about the pizza once the crowd slowed enough for them to breathe). Sorry--no pictures; tight squeeze in the place and I didn't want to be too conspicuous. But trust me--it's a great-looking and authentic New York style "pie." Posted in Restaurant Reviews. Tags: mad donna's, NYPie, smiling elephant on January 8, 2011 by Lesley. Seems sinful, doesn't it? The utter anti-thesis of the no-white diet that I've observed about 75% of the time for the last decade. But sometimes you just have to indulge. Most recipes for a pasta with potatoes involves a nice linguine, pesto, some sort of bean or pea and peeled red potatoes. But the inspiration for me was this tidy little package of Tasteful Selections Honey Gold potatoes I picked up at Publix last week. These potatoes have a beautiful yellow center and have a delicate texture. I'm not the biggest fan of pesto (and certainly not of the storebought pesto I keep on hand "just in case"), so I didn't want to overpower these potatoes with that flavor. I wanted to highlight it. I also had some conchiglie from Lazzaroli that I thought would be the perfect accompaniment (inspired by an entree I had at City House that was not as good as it could have been). So I decided to experiment, but keep it simple. And it worked! Preheat your oven to 400F. Wash and cut the potatoes (skin on) into small, ~1/2 inch cubes. Transfer to a roasting dish and drizzle with ~1 tablespoon or so of truffle oil. Sprinkle with salt and roast for 40 minutes. When there's about 20 minutes left for roasting, start to boil the pasta. The pasta for this dish should not be al dente but should instead be soft. Once the potatoes have roasted, remove the pan from the oven and stir in the garlic (it will cook slightly when it meets the roasting dish). When the pasta has finished cooking, drain it and add to the potatoes in the dish. Stir in the cheese and add more truffle oil, salt, pepper and a dash of herbs de Provence. I think the truffle oil was the perfect complement to the potatoes and the soft pasta provided just enough of a difference in texture to make it interesting. If you have some on hand, roasted or sauteed oyster or shiitake mushrooms would also taste wonderful mixed in with this dish. This is simple and easy to make, but packed with flavor (particularly when you use good potatoes and good cheese). If you're in Nashville, Tom over at Lazzaroli doesn't always have conchiglie on hand, but call ahead and he may put some back for you. It's really the perfect pasta for this meal. Posted in Entrees, Product Reviews, Recipes. Tags: lazzaroli's pasta on December 17, 2010 by Lesley.